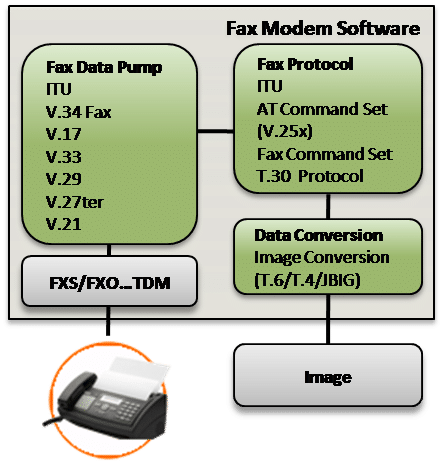 VOCAL provides a comprehensive Fax Modem software library to support a variety of fax applications and fax communications over Radio, Mobile, Internet and other communications networks. Our software includes a complete range of modulations and protocols and VoIP solutions to support your fax development requirements. VOCAL experts can advise you to select the most appropriate fax modem software solution for your application. Custom solutions are also available. Contact us to discuss your fax application requirements with our engineering staff. VOCAL’s modular software library includes a broad range of ETSI / ITU / IEEE compliant algorithms, in addition to many other standard and proprietary algorithms. Our source code is optimized for execution on ANSI C and leading DSP architectures from TI, ADI, Intel, ARM, and other vendors. The software be executed as a single task under a variety of operating systems or standalone with its own microkernel. Our software may be licensed by developers as a standalone module, a library or complete design. VOCAL’s software is available for the following platforms. Please contact us for specific fax modem software supported platforms.